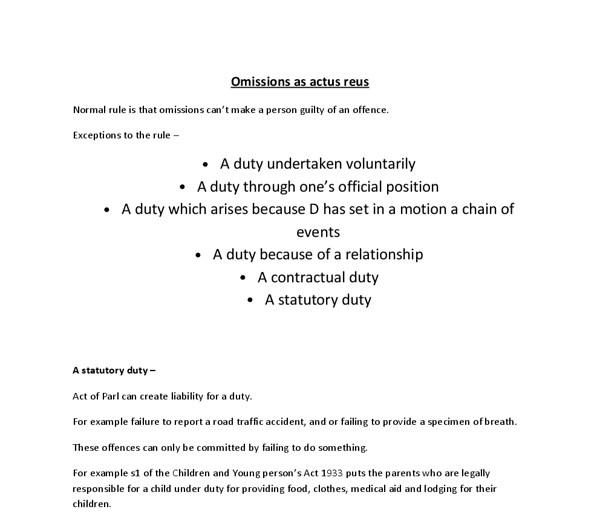 ﻿Omissions as actus reus Normal rule is that omissions can?t make a person guilty of an offence. Exceptions to the rule ? 1. A duty undertaken voluntarily 2. A duty through one?s official position 3. A duty which arises because D has set in a motion a chain of events 4. 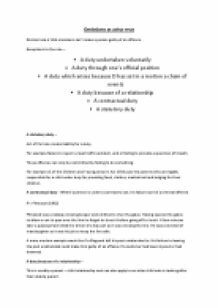 A duty because of a relationship 5. A contractual duty 6. A statutory duty A statutory duty ? Act of Parl can create liability for a duty. For example failure to report a road traffic accident, and or failing to provide a specimen of breath. These offences can only be committed by failing to do something. For example s1 of the Children and Young person?s Act 1933 puts the parents who are legally responsible for a child under duty for providing food, clothes, medical aid and lodging for their children. ...read more. A duty because of a relationship ? This is usually a parent ? child relationship and can also apply to an elder child who is looking after their elderly parent. In Gibbins v Proctor the father of a 7 year old child and his partner starved the young girl and kept her separate from the rest of his kids, the child died as a result of their failure to feed her. Although the child was not the woman?s she had assumed responsibility for the girl as she was living with the man and eating food provided by him. A duty voluntarily undertaken ? In Gibbins and Proctor the partner had voluntarily undertaken to look after the 7 year old child, she therefore had a duty towards the child. ...read more. He was convicted of misconduct in a public place. He appealed on the ground that a failure to act does not create criminal liability. He lost. A duty which arises because the defendant set in motion a chain of events ? It is the concept of owing a duty and being liable through omission. In the case of Miller, the defendant was living in a squat, he had fell asleep with a lighted cigarette and the mattress had caught fire. He was woken up by the fire, but rather than attempting to put it out or seek help he went into another room and fell asleep. The house caught fire and was badly damaged. He appealed against his conviction for arson and argued that a failure to act is an omission and cannot therefore be established as the actus reus of the offence. He lost: it was possible to create liability by failing to remedy a dangerous situation that one has oneself created. ...read more. One of these is that the law can be expanded to involve more duty situations. This is the killing which is caused by an event or situation which would most likely to cause a reasonable person to lose self-control and kill. For example, there was a case where D, subjected to 10 years of spousal violence and degradation, threw petrol in her husband's bedroom and set it alight, causing his death. They are only liable in cases of incompetence, as shown in the case of Adomako, where the defendant, an anaesthetist, failed to realise that one of the tubes supplying oxygen to the patient was disconnected. This resulted in the patient having a heart attack and dying six months later.